The Houston Rockets have won five games in a row and seven of their last nine. All of a sudden, they have the fifth best record in the NBA and are just 2.5 games behind the San Antonio Spurs for the number one seed in the Western Conference Playoffs. During their five game winning streak, they edged the Miami Heat 106-103 in an epic game, absolutely destroyed the Indiana Pacers by twenty-six points, and outlasted the Portland Trailblazers in overtime. Even though these three wins against contenders all came at home, the Houston Rockets have become the legitimate title threat they were touted to be at the start of the season. Over the team’s past ten games, star shooting guard James Harden has averaged 29.3 points per game, 7.3 assists, 4.9 rebounds and 50% shooting. That includes his 41 point, 10 rebound, 6 assist effort on Sunday against Portland where he scored seventeen points in the fourth quarter and arrived to the game looking like a character from a long-lost Sergio Leone spaghetti western. For the season, Harden is twelfth in the league in PER at 22.5 and is fifteenth in usage. To put that in context, LeBron James is second in the league in PER with 29.4 and is fourth in usage. Harden and Dwight Howard have managed to co-exist nicely. Harden’s usage is at 27.7, while Dwight’s is at a very respectable 24.5. In terms of a perimeter and interior star each balancing their touches, it’s hard to find a better ratio than that. Between the pick and rolls the Rockets run with Dwight and either Harden or Chandler Parsons (16.5 points, 5.7 rebounds, 3.9 assists), Dwight is getting his scoring opportunities. He is averaging 18.9 points a game on almost 60% shooting. And when he’s not receiving lobs, Dwight is showing off his severely underrated post game, where he has developed a nice variety of moves and counter-moves. Seriously, just watch the Rockets the next time they are on TV. While the Rockets are in the top ten in most offensivecategories (third in points per game, fifth in fast break points per game, third in overall shooting percentage), they are below league for assists per game—Houston ranks 21st in that category while the Spurs and Heat rank fifth and ninth respectively. If they are going to seriously contend in the playoffs, their offense is going to have to rely more on passing and misdirection in the half court rather than their fast break prowess. Just ask the 2010-2011 Miami Heat. In addition, the Rockets defense leaves a lot to be desired. They are seventeenth in points per game (101.6), allow 13.6 fastbreak points per game and give up forty-four points in the paint during each contest. Their most frequently used lineup (Beverly-Harden-Howard-Jones-Parsons) allows opponents to shoot right around 45.8%, and their ostensibly best defensive lineup (Asik-Beverly-Harden-Howard-Parsons) is allowing opponents to shoot 48.6%—though that figure comes from a SMALL SAMPLE SIZE of seven games and forty total minutes. 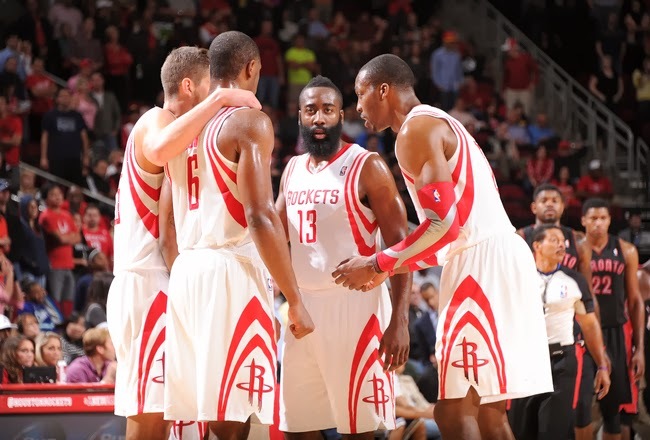 It’s no secret that the Rockets are defensively challenged. Much has been made all over the Internet of James Harden’s shortcomings as a one-on-one or team defender. But Dwight has had a down year defensively. He is letting opponents shoot 48.5% at the rim, which is about 4% higher than most other elite defensive centers in the league: Joakim Noah (44.6%), Robin Lopez (42.8%! ), Andrew Bogut (44.7%), and Roy Hibbert (a staggering 41.7%)*, And he is thirteenth in the league in defensive rating. That’s a bit of a change for a guy who was number one in defensive rating and defensive win shares from 2008-2011, collecting three NBA Defensive Player of the Year Awards in that same span of time. Will Houston’s defensive shortcomings ultimately derail their title hopes? It’s very possible. Their offense is potent and they are getting solid contributions from Terrence Jones (11.6 points per game, 5.2 rebounds per game), Patrick Beverly (9.8 points per game and 36% from three point range), and the up and down Jeremy Lin. New addition, Jordan Hamilton has shown promise in his first few games with the team, but it remains to be seen how he will fit into the playoff rotation. In any case, Houston certainly as multiple supporting options to go along with the Harden/Howard/Parsons trio. However, after watching San Antonio dismantle Miami last week, it’s hard not to envision the Spurs using their precision passing in the half court to do the same to the Rockets. Houston has handled San Antonio so far this year, but the Spurs are slowly rounding into shape. And sure the Rockets have plenty of firepower, but is that enough to overcome a potential second round match-up with the Oklahoma City Thunder who bring their own fifth ranked offense to the table? The two teams play tonight, both at relative full strength (OKC is without perimeter defender Thabo Sefolosha), so we could be witnessing a playoff preview. For the Rockets, like most playoff teams, it’s going to come down to match-ups. Right now, they would play the Golden State Warriors in the first round, which would make for an exhilarating, fast paced series. The Warriors eighth ranked defense is underrated and Andrew Bogut is an elite low post defender and rim protector. And we all know the Warriors can score and that Curry is bound to go off in at least two games in a series. Houston plays 11 of it’s last 19 games on the road including. Starting tonight, their next three games are at Oklahoma City, at Chicago (red hot at the moment), and at Miami. The rest of their schedule for March is pretty easy save for a home game against the Clippers, but they also have to host the Spurs for their second to last game of the season, a result that may end up deciding whether they take the number two seed (and a more favorable match-up against the Mavericks) or could potentially see them fall to number four and have to face the Clippers or the Blazers—two teams that can match their firepower. No matter what, the Western Conference Playoffs are going to be brutal from top to bottom. Even if Houston does get the Mavericks in a two-seven match-up, it won’t be easy. But with their recent play, the Rockets have shown they have just as much a chance as anybody else to come out of the West and play in the NBA Finals in June.